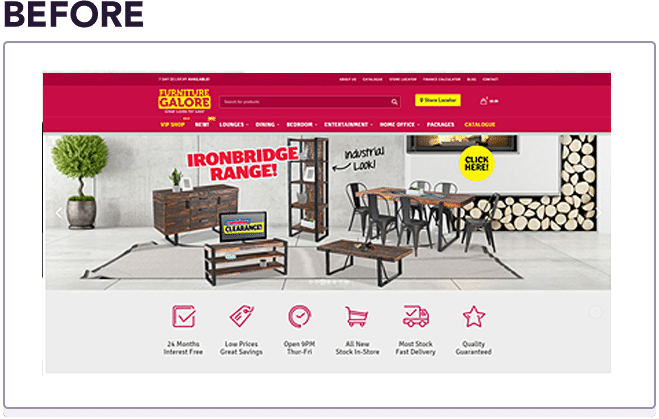 Furniture Galore is a leading furniture retail chain in Australia, who pride themselves on offering their customers great styles at very affordable prices. Furniture Galore had been successful with their online marketing, bringing in a significant amount of traffic every month. However, they knew their website had potential to convert this traffic to more store walk-ins and more online sales. Visitors were finding it very difficult to find the product they were looking for quickly. Their products were also not converting to online purchases, and the Furniture Galore team didn’t know why. They needed an optimisation plan to increase store walk-ins and boost online sales. Keen to listen to our client’s goals, we began by first tackling how to increase in-store foot traffic to Furniture Galore’s stores. We cleaned up the website’s analytics and planned ideal journeys for the path that visitors would travel from entering the website to walking into the store, ready to make a purchase. We watched what drew people to viewing products and what compelled visitors to pursue ‘Finding the nearest store’, and worked to replicated that experience for other visitors. After an in-depth CRO workshop with the team, we undertook a thorough analysis of heat maps and video recordings, user polls and surveys to understand their customers’ desires and frustrations on various pages. We made a comprehensive list of crucial findings..
We proposed hypotheses and tests for these findings, and prioritised them based on how much of an impact they would make on revenue. Fresh new pages of Home, more compelling category pages, product and other crucial pages were designed and AB tested. It resulted in a 31% increase in in-store foot traffic. We used these same findings to test Furniture e-commerce store. After the first round of tests and subsequent changes, their e-commerce revenue increased by 53%. The Furniture Galore team were so happy with the results that they decided to have the Conversionry continue with ongoing monthly testing. Four months into the testing program revenue increased by a futher 26%. 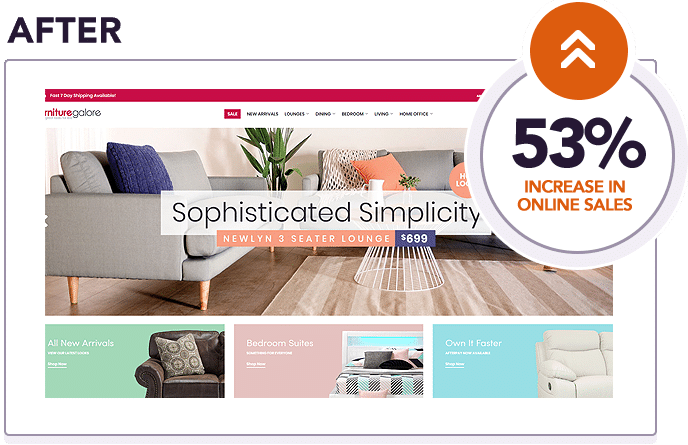 We are pleased to report that Furniture Galore’s conversion rate and e-commerce revenue continues to increase every month. 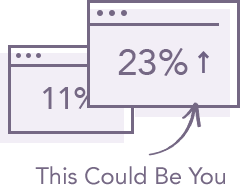 The extensive testing on the website has really paid off and the sales prove this.